A little digression here but I promise to come full circle. So I set aside a weekly lesson for myself. It was great to start something from scratch. As someone who naturally enjoys teaching others, I have always found it helpful to be a student. A teacher who masters their craft can often forget what it feels like to be a novice; over the years I have purposefully taken the role of student (learning soccer, piano, swimming and now writing). It’s a good exercise in humility for the ego and wonderful to experience the physical sensation of neurons and synapses firing, which literally give us an electrical charge. What I discovered about myself along the way was profound; a kind of therapy on the piano bench – ok, a bit of an exaggeration, but it sure was thought provoking. I have this quirk whereby I like to create a parallel between things. I think it comes from years of trying to teach clients how to understand the complexity of physical movement in simpler terms. While learning piano I was eager to excel. I was taught in a methodical way and I practiced regularly; which was a bonus because it made the kids practice more too. However, I found myself memorizing my pieces. Perhaps the Conservatory is partially to blame…they offer additional points in the exam for memorization. But the thrill of actually playing music came with memorization and it gave me confidence not having to rely on the sheet music. The problem with this is that I became dependent on memorization because I didn’t trust myself to read the notes anymore. I absorbed the rhythm and notes and pocketed them into my memory and played quickly, dare I forget what came next. How could I have done that? I already knew that with physical exercise you have to start with a solid foundation- seems as though it didn’t translate to the piano. It worked wonderfully for a while. I completed my Grade One exam: Honors with Distinction. The exam wasn’t pretty, my hands were shaking like a leaf and I kept wondering why I was putting myself through this stress? (As per FEAR? that was a biggie). Any classically trained musician will tell you that playing from memory isn’t ideal. It’s fine for performance but not when you’re starting out. One has to learn to read the notes. I have discovered that I am no exception. Aren’t we all like that a little bit? Wanting to skip the Wall Press to get to the juicy Push Up to feel all knowing and masterful? As a result of this faulty approach, after a period without practice, it’s like starting all over. I labor over which note is which, though it does come back faster than learning for the first time. So I promise myself to play slower and read my music. I know it will pay off. I have to ease off the instant gratification of playing with zest and speed, and learn to make real music. This brings me back to the first line of this post. When we practice physical exercise it’s just as important to start at the very beginning. Just because it’s your body and it’s been following us since birth, it doesn’t necessarily mean that we know how to use it. We need to stop pushing ourselves around and bullying our body to do what we want. At a cellular level the body is very forgiving. Let’s show ourselves a little more compassion. A little bit everyday is the way to go. Just ask Great Aunt Lea. One last thing…regarding piano practice. I try to practice daily (it doesn’t always happen), but even if it is for only one minute, because the cumulative effect from revisiting the notes daily makes more of a difference than not practicing anything until I have an hour to devote. Can you see the parallel with the 4 Minute Mornings? Anyone? Bueller? Aha …… you hit the correct note here. There is no substitute for reading those notes. 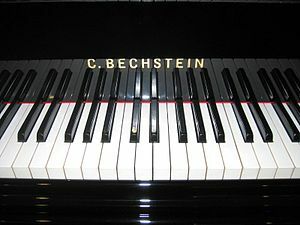 it is the basis for really learning to play the piano … or any other instrument. When it becomes as easy as reading a printed page, then the fun begins. I missed out on this basic because my first teacher gave in to me demands for “music” which sounded good. So I slogged through pieces way too difficult for me, picking out the notes laboriously one by one. And memorizing them. I could play a couple of pieces very well but still couldn’t sight read. i accumulated three assorted degrees iin music before I actually learned to read those notes fluently. I had to ….. because I had to play those new pieces for my students. There are no short cuts. I have my students “play and say” with note cards. They play the note and say its name as I flip through those cards. I make a game of it. But I also make sure they do it. Wonderful to read a post by someone who really wants to learn the piano. My adult students are my pride and joy …. Thanks for the comment. I forgot to mention when I left my comment on your site, that my 8 year old daughter actual likes working on Theory more than actually practicing the piano. She’s a lot like me in the way that she panics with reading the notes and so quickly learned how to memorize the pieces or memorized the finger patterns. It is really amazing how we can adapt in these peculiar ways. Just goes to show how powerful the mind really is. As a result of loving theory, she is actually comfortably learning to read music at her own pace and probably better off! She is a naturally gifted visual artist so I think that the writing and drawing of notes puts her at ease and allows her to absorb the information in a familiar medium. Looking forward to reading more on your site. Thanks again for making contact! “Let’s start at the very beginning. It’s a very good place to start. First you begin with ABC. Then you go on to Do,Reh,Me…” (Julie Andrews, The Sound of Music) – Great post Kat!